In the interests of completeness, here is the revised Guidance document “Careers guidance and inspiration – Guidance for general further education colleges and sixth form colleges” that was released yesterday. 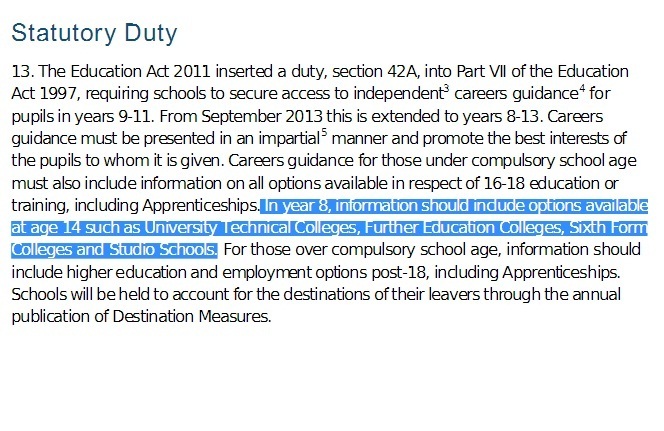 For those familiar with the corresponding schools careers guidance the document is much of a muchness with the requirements of the duty for independent guidance on all routes to be provided for students in a number of suitable methods. Case studies highlight different ways of achieving this (including utilising organisations such as Career Academies) and Destination Measures are held up as the method of accountability. The document then runs through a number of online resources that can help achieve Sixth Forms and Colleges achieve these aims. The BBC 3 Counties radio reporter Paul Scoins gained a leaked version of the Skills Funding Agency report and broadcast the findings on the morning of February 18th with a follow up story on the BBC website. Mr Scoins had earlier reported on the testimony (given with condition of anonymity) of ex teachers at the Federation’s Academies which accused Senior Managers of pressuring teaching staff to spoon fee students. In the interim before the full reports publication, the Federation appointed Dame Jackie Fisher as interim CEO. An annual staff celebration event was held costing £20,000 in 2013 and £25,000 in 2011/12 with £7,200 of these costs recouped from private sponsorship. A total of £3,127 was spent on alcohol at these events. On the same day, Sir Peter released a statement in response to the findings. Also on the 28th were released 3 financial notice to improve letters, one to the Barnfield Academies Trust, one to Moorlands Free School and one to the Barnfield Skills Academy Trust each with their own requirements to improve, timescales by which to submit plans and notification of further EFA visits to check progress. The final piece of the paperwork jigsaw was a summary letter from Lord Nash and Minister Hancock summarising the assessment of the FE Commissioners findings of his visit to the College with its own requirements on the College to alter its structure and leadership and consider a vision for the future to be submitted before the end of March 2014. The investigation covers the period while Sir Peter Birkett was the CEO of the Federation. During his tenure he was awarded a Knighthood in 2012 for his services to the “Further Education and Academy Movement” and name checked by in speeches by Michael Gove for his leadership achievements. Incidentally the Barnfield Skills Academy mentioned in that speech has also recently incurred the wrath of Lord Nash for it’s poor performance in last summer’s results. His tenure also saw the downgrading of the College by Ofsted to Satisfactory in September 2012 and the downgrading of Barnfield South Academy to “Requires Improvement” in May 2013. South Academy immediately launched an appeal against the rating which, presumably, was unsuccessful as the 3 rating still stands. For this service to the public of Luton Mr Birkett was remunerated to the tune of £193,000 with £15,000 in benefits in 2010/11. (April 2014 edit – data released this month shows that Mr Birkett’s basic salary in 2012/2013 was £228,000). He left his role at the Federation in July 2013 to take up a role at the multinational education company and newly approved UK academy sponsor, GEMS as their CEO and was soon attending seminars with the likes of ex-President Bill Clinton. However this was short lived as he left suddenly on the 3rd December 2013 so to stop the investigation becoming an “undue distraction” for his new company. Still, the Federation has also continued to impress outsiders as they won “Best Academy Chain” in the 2013 Education Investor Awards. This though, didn’t stop the Federation losing the next two secondary academies they attempted to sponsor, first due the decision of Puttteridge High school’s Governors and then by the DfE rejecting their half completed sponsorship of Sandy Upper School. Soon after news of the investigation broke through the local media Sir Peter released a statement. 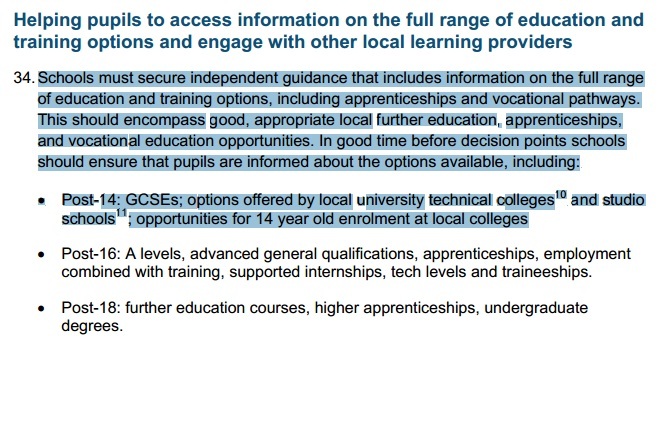 Most importantly, all of this does not in any way help the current school leavers of Luton who would benefit greatly from a vibrant, energised FE route in the town. Across the 12 High schools in the Authority there is only one with an established Sixth Form and the two, recently opened, other school based Sixth Forms are in academies run by the Federation. This means a the large majority of the town’s youth move educational establishments at 16 and those offering quality routes and a good local reputation should enroll healthy numbers. Yet the most recent set of town wide destination data shows the number of students enrolling in FE Colleges each year has fallen from 1026 in 2008 to a low of 808 in 2012. Consider this against a backdrop where nearly 50% of students from both of the Federation sponsored Academies now move onto the FE route then you can see just how far the College’s stock has fallen among the youth of the town. Luton Council is currently pushing through a range of upgrades to local infrastructure and transport links and promoting the town as a location for businesses to establish themselves. While striving to improve employment and investment prospects for the area they should be mindful that these companies will need a local skills base on which to draw. Nationally, there is an expectation on the FE sector from Ministers to be drivers of local enterprise and skills which will assist in the economic recovery. A revitalized Barnfield, able to move on from this investigation, would not only benefit young people but also support the future economic prospects of the area and I wish it every luck and support in success in those goals. Set against a backdrop of Raising the Participation Age, Local Authorities struggling to track their 16-18 residents and the pressure on schools to ensure productive destinations for students, this is an unhelpful step for those of us who work in schools. Hard copies of application forms mean that we can work with students to complete them, we can use the ‘officialness’ of the form to everyone’s benefit when motivating revision weary minds and it means we can track who has applied to what at where and intervene if necessary. I really hope our students don’t apply for 7 A Levels but if I don’t see their application I can’t promise it. I really hope that our students don’t apply for the Level 3 Public Services course without 4 C’s in their predictions but if I don’t see their application I can’t promise it. I really hope they manage to apply in time and by seeing their application I can promise this. The obvious push back from the FE sector already severely concerned about school IAG will be that none of the above happens anyway so what difference will it make. There isn’t much of a concrete, data based rebuttal I can give to that other than to plead for more time for schools to begin to grasp their new responsibilities with this work. However this transition conundrum is solved, it will require partnership and collaboration from different education providers that relies as little as possible on hard pressed Local Authorities who will be braced for the full storm of austerity to come. Where ever the fault lines run for current any disconnects between schools and FE providers, removing the major part of the transition equation we do have the potential to assist with won’t help.